The Nissan GT-R50 by Italdesign will see a limited production run of just 50 units; customisation options available for the production-spec model. After presenting the hand-made iteration of the GT-R at this year's Goodwood Festival of Speed, Nissan has lived up to its promise of putting the bespoke GT-R50 into production as it has officially opened up the order books for the 50 production units of the GT-R50. While the prototype was finished in a combination of grey and gold accents, customers can specify the exterior colour and interior trim option of their choice for their GTR-50. Apart from the customisation options, the exterior of the production-spec car remains virtually unchanged from the prototype. Based on the mechanical underpinnings of the GT-R Nismo, the GT-R50 pumps out 710bhp and 780Nm of torque, thanks to a pair of larger GT3-spec turbochargers and plenty of other race-derived equipment. The deep-pocketed enthusiasts who wish to order their GT-R50 will have to shell out an eye-watering pre-tax amount of €990,000 ( ₹7.96 crore approx.). To put things into perspective, this amount can get you five pieces of the regular GT-R Nismo! 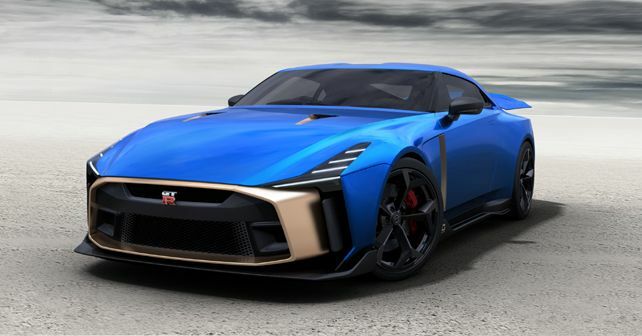 'The reaction from Nissan fans around the world – and potential customers of the GT-R50 – has greatly exceeded our expectations,' said Bob Laishley, Global Sports Car Program Director at Nissan. 'These 50 cars, which celebrate 50 years of the GT-R as well as 50 years of Italdesign, will be rolling tributes to Nissan’s engineering leadership and rich sports car heritage for a long time to come,' he added. Deliveries of the GT-R50 will begin in late 2019 and will continue through 2020.